From the kitchen of One Perfect Bite... I first sampled this dish at the deli counter of Central Market in Austin, Texas. That was over ten years ago, but I have yet to see it featured in delis or markets here. I'm going to assume there are other areas of the country where the dish is also unknown and proceed with a recipe for this toothsome steak. This is a simple way to prepare cuts that are normally served for London Broil. London broil refers to a method of cooking rather than a specific cut of meat. This recipe was developed to be used with thin cuts such as flank or flat iron steaks. Cuts from the round and shoulder can be used, but cooking time will vary and the meat may not be as tender. Regardless of the cut, I always tenderize the meat. I use a jaccard, but piercing the steak at intervals with a fork will also work. The steaks are not marinated and they are seasoned only with kosher salt and fresh cracked pepper. I've found that marination isn't necessary when a strong sauce is used at the end of cooking. The sauce used here is an adaption of the Argentinian chimichurri. Earlier this week we featured a recipe for a parsley salad and any leftovers from that dish are perfect for use in this application. When there are no leftovers to be had, I used chopped flat leaf parsley to make the sauce. Whenever possible I use a flat iron steak for this recipe. It has become my favorite among the affordable steaks for grilling. While the recipe was developed to be cooked on an outdoor grill, it can be made stovetop in a grill pan or broiled. Here's the recipe for this surprising delicious dish. 1) Combine parsley, onion, garlic, vinegar, olive oil, 1/4 teaspoon each salt and pepper and pepper flakes in a small bowl. Season both sides of steak with remaining salt and pepper. 2) Grill steak over very hot grill until both sides are brown, about 5 minutes per side. yum! that garlic and parsley sauce looks so fresh and flavorful! Just perfect for perking up a London broil. WOW...this looks scrumptious! Juicy and tender...perfectly prepared. Could I join you for the dinner? It all looks perfectly delicious! London broil is one of my favorite cuts. I think your fresh parsley sauce is terrific too! Thanks so much. Beautiful n very tempting click Mary. I love this one too. You keep amazing me... this looks fantastic. I can almost taste it with my eyes. Wonderful photo! This looks totally and completely amazing! That is one seriously beautiful cut of steak. Now I'm hungry. Parsley and garlic, that sauce must be divine!! Looks absolutely delicious! Yummyilicious dish, looks sooo juicy and delicious..
will definately be giving this a try. look so comfort and good. Have a nice weekend ahead Mary! Wow, it looks perfectly cook! and I love the topping, amazing flavours. I remember making London Broil years back, Mary. It seems to me I stuffed it and it always involved some sort of tomato sauce. Lovely to have this new recipe for an old favorite! Hi Mary! I had no idea that London Broil actually referred to the method of cooking. Nice to learn something new everyday!! Your dish looks amazing! Have a great weekend! Very juicy, it looks really tempting the way you photographed it. WOW..that looks amazingly delicious...love the photographs of the dish..superb..I hope you have a nice weekend..tk care! This looks unbelievable! 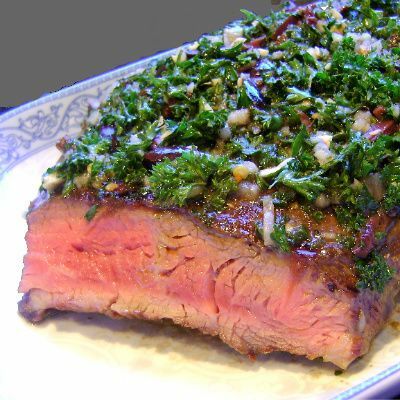 We love chimichurri in our house and like you mentioned usually use on a flatter steak like flank or even better skirt - but skirt tends to be expensive now a days. London Broil is affordable and when topped with your flavors here - PERFECT! Thanks again! Look at that lovely colour Mary:D London broil needs to show up on my BBQ soon!! Garlic and parsley adds a lot to anything! I haven't fixed London Broil in "forever"! Sounds so good -- haven't had a London Broil in quite a while, but do enjoy the flat iron cut. Makes me want to grill now. Oh, the sight of London Broil floods my mind with happy memories. It was one of the first things I learned to make as a newlywed! The parsley sauce sounds fabulous! I bet those minutes under the foil tent with that sauce makes the steak amazing. Since I love chimichurri... i think this will be a big hit!! Once again, I'm drooling over your post!! I love this steak, it looks beautiful. I just made a chimichurri sauce (I'll be posting next week) two nights ago, they are so so so good!! That's a delicious looking meal. Whenever i see some recipes like this in a TV show, i really want to try, but i'm not used to that so i just get confused how to make these dish. Beautiful presentation, Mary, and you've cooked your London broil exactly to my taste. You are making my mouth water....want so badly! Oh. I love the idea of the garlic parsley sauce. Wonderful! I could go for a couple of slices for lunch today. Now that looks like the perfect steak! I can almost taste it. What an original way of preparing it; it tastes summer. Sorry I had to redo! What a beautiful picture of the steak with the colorful parsley sauce on top! Your steak is perfectly cooked and looks mouthwatering. I don't often eat red meat but this looks fantastic! I love the freshness of the parsley sauce. Mary, this looks delicious and done to perfection! We are able to get flat iron steaks and like them. They have much more flavor than some of the more expensive cuts. I think any leftovers would be perfect on a fresh Kaiser roll. Thanks! I have to admit to not eating red meat but I'm thinking that sauce seems pretty flexable! Wow, that looks like heaven. What a gorgeous piece of meat! I did not know about London broil, thank you for the information! oh yum! the seasonings on that sound amazing! Love all these flavors. This broil looks perfect Mary. questa metodo di preparazione deve essere molto fresco oltre che buono ! Ho proprio voglia di fare questa grigliata in montagna !! Wow does that look flavorful and delicious. The beef is perfectly cooked. Your steak looks absolutely perfect. Exactly the way I like it! Flank steak is by far my favorite cut of meat--this recipe looks like it would enhance the whole flavor of the steak! Mary, that looks so beautiful. The meat is cooked just right. The parsley sauce sounds delicious. That meat looks like it's cooked to perfection. What a treat. There is nothing better than a perfectly cook flank steak! Mary, you never fail to tickle my palate with your delicious dishes. This looks amazing! And oh I wish there was a Central Market here in Charlotte. I miss it so much from my days back in the Lone Star State. The meat looks really juicy and flavourful with the sauce. It looks great when it cooked in 50-50! Unfortunately, I don't take beef but i would prefer mutton. hehe.... Have a great time. That parsley and garlic sauce adds such a nice zing to the London broil.